980nm photons more expensive than 808nm? There weren't that many threads (actually I found a fair amount of threads, but they weren't many considering the thousands regarding 445nm and 532nm lasers) on IR lasers so I didn't find exactly what I was looking for. So, I'm doing a little search on the web to see which wavelength I should buy. While doing this I noticed a difference (in every website/store I found) in the pricing of 980nm and 808nm diodes. Why is that? Are they less efficient or is there another reason? Oh, and to avoid making a new thread about this, here's another question (more like questions) I have. The reason why I'm interested in buying an IR laser is for burning purposes. Now, what would you recommend? A 808nm laser or a 980nm? 980nm is much cooler since the dot will be totally invisible (It would be cool when showing it to friends), but how would I know that it has reached the tightest point that the dot can get to? 808nm diodes are cheaper(in some cases) then 980nm ones since 808 is used in most DPSS process, including 532/473/589/593.5/404/671/1064 etc... since it has more uses, it's cheaper. or you may be able to use a camera to see the IR, even your phone camera may be able to see it. See in this video about 3 minutes into the video you can see how it looks on camera even though you can't see it with your eyes. Does it have to be an IR laser for burning? Do you have to have the invisible beam? But to make the 532nm lasers, aren't you just using the second harmonic of 1064nm? Meaning you double the frequency, therefore the wavelength gets halved. So, from 1064nm you get 532nm. I know that the 532nm lasers leak 808nm radiation, I never knew why though... And how exactly is 808nm used in the making of a 1064nm DPSS laser? I have never heard of glasses that let you see IR, I think only a camera can do that. 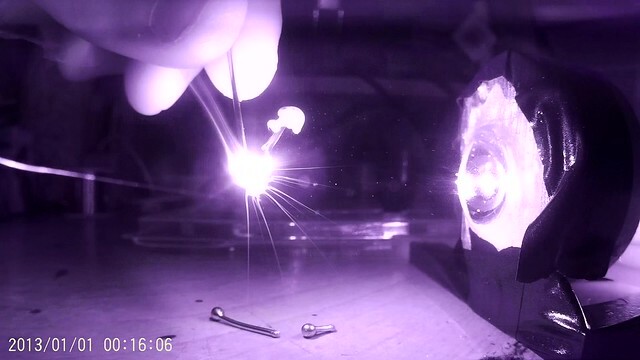 532nm lasers leak 1064nm, the 808nm pump diode is just a light source for a crystal that is the actual lasing medium, that crystal is the 1064nm laser that is then passed through another type of crystal that converts it to 532nm. The 808nm pumps the ND:YVO4 or ND:YAG and it will fluoresce and when this is placed inside a cavity it will lase on a given wavelength determined by the cavity coatings . In the case of a 532nm laser the YAG or YVO4 lases at 1064nm . Easiest way is to use a camera that lacks a IR filter to see the IR light . goggles wont let you see it , they block it . 7W 940nm , the line to the left in the middle is IR light leaking from the fibre . Actually, unless something has changed, O-like tend to be rather reliable! If you are going for IR you absolutely need to get safety glasses for the wavelength you are using, seeing as it's impossible to tell where the beam is actually going in many situations. Use an IR card or camera that can see IR to view the dot. It may be interesting to note here that the infrared leakage is mainly 808nm, not 1064nm. The 1064nm is reflected back into the Nd:YVO4 by the output coupler, however, the output coupler is not coated for 808nm, and this radiation passes through unhindered. As a result, the majority of IR laser radiation leaking from cheap laser pointers and modules is 808nm, not 1064nm. The only time 1064nm will leak out is if the coatings on the output coupler are damaged. I've read mixed reviews, especially the past two years. I've heard that it was a decent and reliable site, but up to a point. Yeah, I'll probably buy an IR viewing card. I think I'm going with the eagle pair as far as laser safety goggles go. I find this scary. No one seems to mention it and that is even scarier. So you don't mind frying your friends' eyeballs as the specular reflection from burning objects send high power IR to their eyes? Being not able to see the beam is more dangerous as you have no idea how much laser power is going into your eye. It just burns your retina out. I am familiar with the dangers of IR lasers. I know that it is obviously much more dangerous since it is invisible to the human eye (you wouldn't close your eyes until it was too late). It doesn't really give you any when its invisible.